We’ve been working on our spring/summer garden lately and just finished up a project I’ve been wanting to do for a while! After seeing a whole variety of different kinds and styles via Pinterest, I knew I wanted to make some cute plant markers for the garden. And, Big Brother thought we needed a garden bug! 😉 One thing we have a lot of is rocks–so painted rock garden markers it is! Aren’t they cute?! This project was so easy to do with help from one of my favorite crafty products– Elmer’s Painters Markers. I love them and already had a couple of packs. But, I needed a few additional colors to help with my fruit & vegetable paintings! 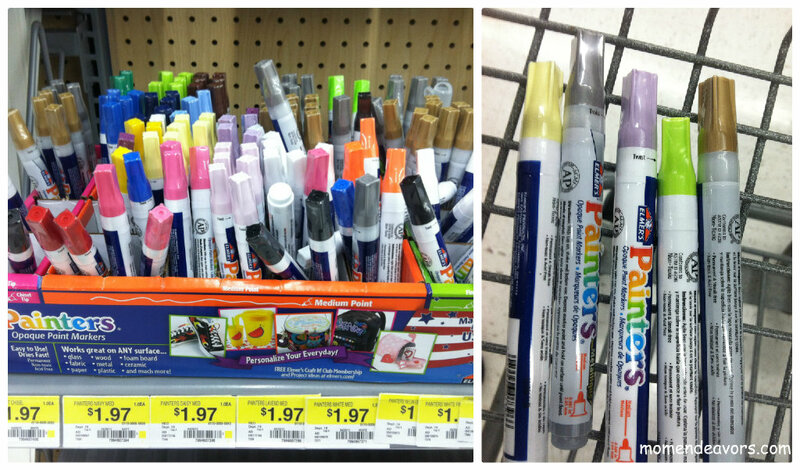 So, I was thrilled to see that they are now offering single Painters for only $1.97 a piece. There was a good variety of colors sold individually–and I snagged 5 that I didn’t already have. (You can see my whole shopping trip here on Google+). 1. Start by painting your rocks. This was a perfect job for kiddos to help with, as it doesn’t really matter how messy it gets. Big Brother had great fun painting! 2. 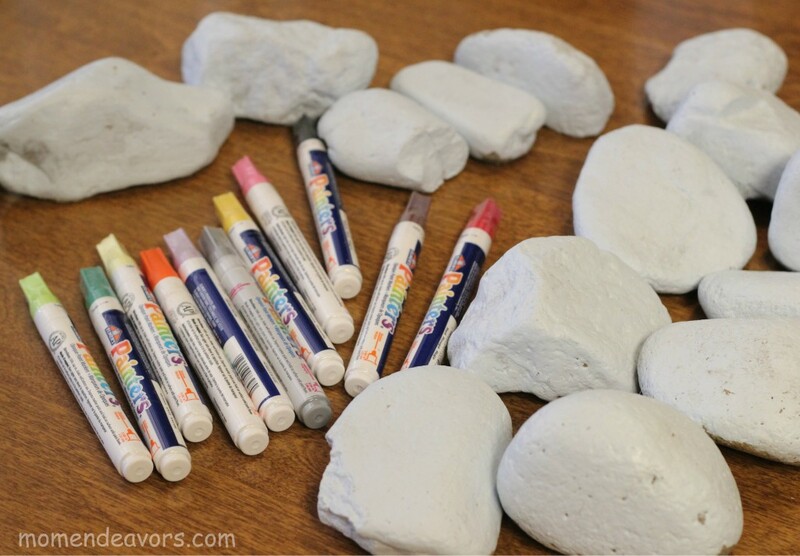 Once all the rocks are dry, use your Painters to write/draw on the rocks. With Big Brother learning to read and a 2 year-old around, I decided that I wanted our markers to have words and pictures. The Painters were easy enough to use that Big Brother could even help with a few of our drawings. He colored in our tomato and helped work on our ladybug! If you allow for a little drying time, you can use colors on top of other colors with no problem! What is growing in YOUR garden right now? For more from Elmer’s, be sure to follow along with them on facebook and/or twitter. Disclosure: I am a member of the Collective Bias™ Social Fabric® Community. This shop has been compensated as part of a social shopper insights study for Collective Bias™. #CBias #SocialFabric #ExpressYourself. However, all photos, opinions, and experiences are my own. These are on my to do list as well! It is such a nifty idea! Great minds think alike! 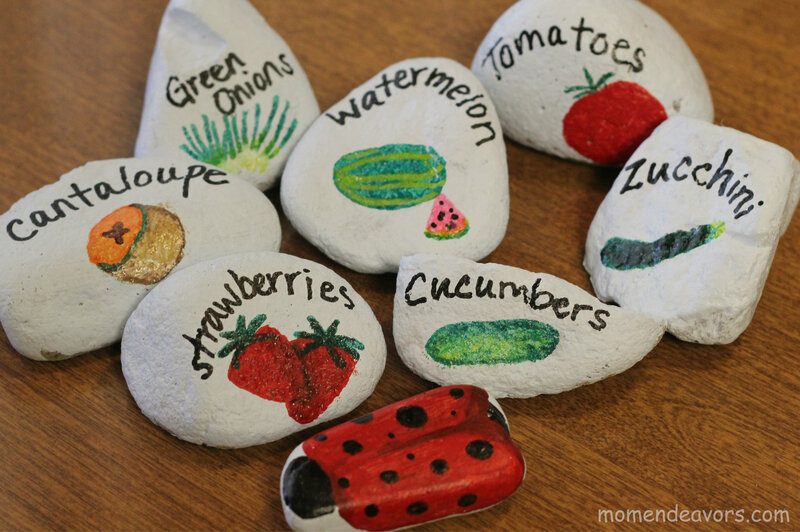 I love what you did with stones, really cute idea! Great idea, I need markers for my Hosta names. The little plastic tag that comes in the pot is lost or broken in one summer. We have a very long list of what is growing in the garden: tomatoe, potato, green bean, scarlet runner bean, peas, okra, brussel sprouts, green pepper, jalapeneo, radish, turnip, kolrabi, lettuce, broccoli, sunflowers, assorted wildflowers, zinnias, lillies, strawberries, raspberries, apple trees, pear tree, peach tree, asparagus,, grapes, pumpkins, squash, gourds, zucchini, watermelon, spinach, rhubarb….. i might have forgotten something !!! LOL. This is genius! We plant a vegetable garden every year and this will be a great addition to our garden! What a great (and easy to do) idea. So cute! Love it… might need to go pick some up tomorrow! Adorable! Love finding plant markers that withstand the elements! I’ve been wanting to try this project!! It will be so much easier to use the Elmer’s markers than trying to use a paintbrush (I am NO painter!). Thanks for the tip, Sara! These are so cute! 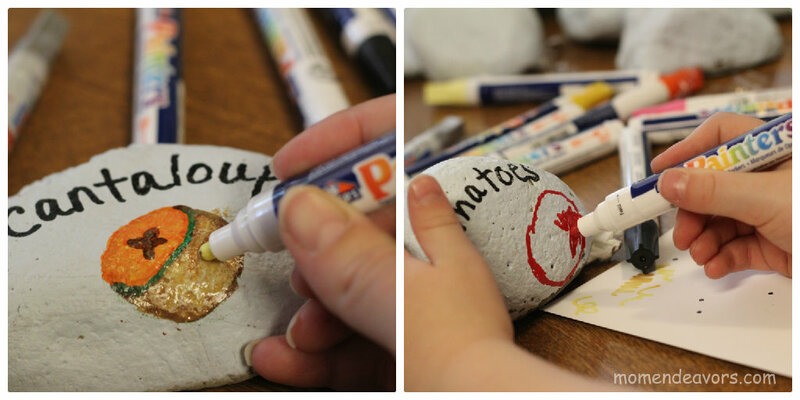 I love Mod Podged rocks, and I never thought of painting them – trying that next!! Oh what a great idea! That’s an awesome and beautiful way to mark where your plants are! These are darling! I love this idea! Oh. How. Cute!!!! My girls would adore this for the little container garden we just started! So cute! I can’t wait to do this! So cute. If I could only draw! How cute are those!?!?!?! Love it! I can’t wait for everything to start growing!!! 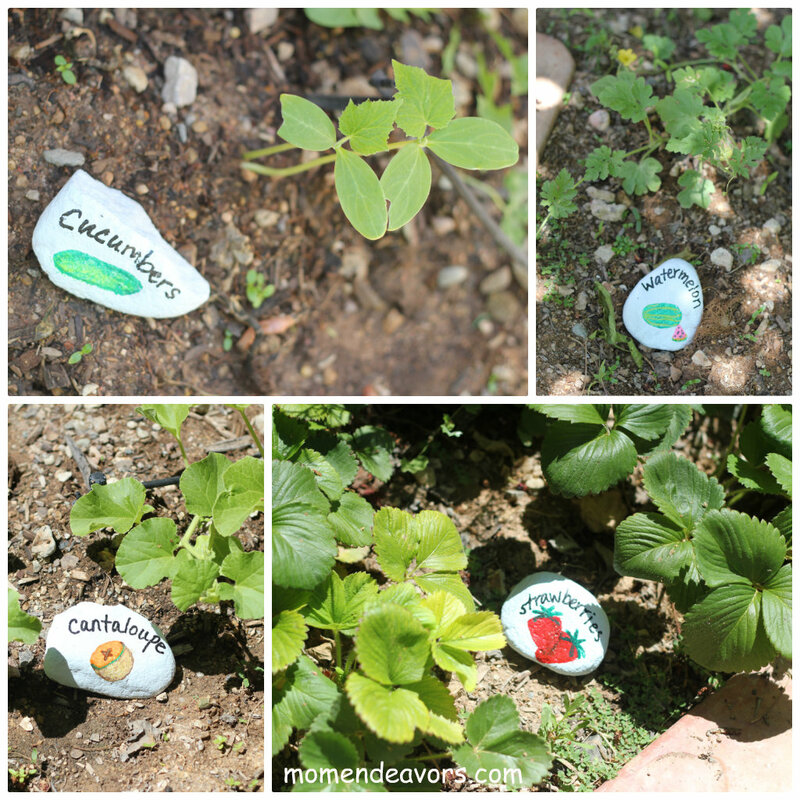 These are so cute and now that I have a garden I might just have to try these! SO darling Sara! I absolutely love your garden markers!! I need to make some now! Yep! The markers are permanent. They held up great!